Summary: A long ago prophecy of a child being born in the Half World to heal the rift between the three realms seems to be coming true when a pregnant woman is banished for fourteen years. Melanie, the unborn child from the incident, is born in the real world and lives fourteen years with a mother who seems to be fading away. Knowing nothing about her parents’ past and with just one picture of her absent father, Melanie is caught off guard when she receives a note from crows to go home only to go there and find her mother missing. Directed by a mysterious phone call to make her way to the Half World, Melanie finds herself on mission to rescue her mother that will test her mettle and challenge her to face fears she never knew existed. Review: When the Realm of the Flesh, the Realm of Spirit and the Half World are divided, a prophecy emerges stating the only way for the realms to be reconnected is if a child is born in the Half World. The Half World is supposed to be the bridge between the Realm of the Flesh and the Realm of Spirit. In an ideal system, when one passes from the Realm of the Flesh they enter the Half World to work out the most traumatic part of their life before ascending to the Realm of the Spirit and then being born again back into the Realm of the Flesh. Severed connections between the realms means those in the Half World are stuck in their own personal nightmares with no hope of ascension. Some become monsters as a result, and the monster that rules them all is Mr. Glueskin. Probably the only one who is happy with the way things are, Mr. Glueskin has a vested interest in not allowing the realms to reunite. He banishes Melanie’s mother when she’s still pregnant, instructing her to come back with the child after fourteen years. Trying to protect her daughter, Melanie’s mother tries to return without her, but Mr. Glueskin makes it clear to Melanie this is not acceptable. I love Half World by Hiromi Goto for several reasons. Main character Melanie is an unlikely hero. Overweight and bullied at school, she has low expectations of herself, but when her mother disappears Melanie doesn’t hesitate to go after her. Melanie meets each challenge on her quest with resolve, even though she is convinced she has no idea how to get her mother back and Half World is bone-chilling place full of suffering. She is aided by a wonderful neighbour named Ms. Wei, a jade rat and a variety of other characters who sense her willingness to face whatever she needs to while trying to rescue her mother. Goto’s writing is polished and striking, and I couldn’t stop tagging memorable quotes because of her vivid way of describing characters and settings. Though Half World is a story that blurs the lines between horror, fantasy and adventure and maintained a level of creepiness I usually can’t stomach, I couldn’t put it down. What drew me in was Goto’s exploration of the roles of the various realms, her insightful look at the psychological effects of relieving the worst moment of your life over and over again and the power of choice to change things. Underneath everything is a pervasive respect for life, no matter what it brings. I’ve put the age range at 16-18 because Goto’s vibrant descriptions are disturbing at times, and the book has its’ violent moments. It won’t be an enjoyable read for everyone. That said, one of the best parts of Goto’s story is there’s a sequel, a book about Gee’s life called Darkest Light. “Gao Zhen Xi’s eyes flew open. They glinted, momentarily, with a jade green fire. ‘It is not a matter or knowing the solution to righting all the wrongs. That is an impossible task. Even for one such as you.’ She smiled fiercely, and Melanie wondered at the respect in the old woman’s voice. Respect, for her! “To have lost all that she had known and loved so dearly. . . . Was there life, still, after that? A tiny flame flickered inside her. “The nuances of moss, rich and lush upon the trunks of trees that lined the block. The coarse umbers of barks, glowing with grey-blue lichen. Invisible birds twittered in a mess of blackberry brambles in an empty lot across the street. In front of the co-op apartment building a few doors down, a camellia was blooming its deep pink flowers, their yellow centres a miracle of brightness. She stared, mesmerized, at the cars that whizzed past, their tires splashing through small puddles of water. The vehicles seemed remarkable marvellous in ridiculously bright shades of red, yellow and teal green, cobalt blue. The colours zinged into her brain as if they were sound, and the symphony was simply glorious. It was so good to be still. 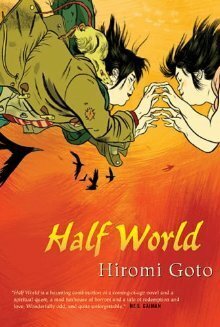 Half World by Hiromi Goto, illustrated by Jillian Tamaki is published by Puffin Canada, (2009).